By the end of the 1960s study of the solar system extended from Earth to the nearest planets, Mars and Venus; and men had landed on the moon. In the next two years the Apollo astronauts made a searching exploration of the moon, after which Skylab crews turned attention toward Earth and the sun. During the early 1970s unmanned spacecraft also added Mercury, the asteroids, and Jupiter with some of its satellites to the list of objects in the solar system that scientists' instruments had been able to reach and observe, and had begun the long trek to Saturn and the outer planets. By the mid-1970s another order of magnitude had been realized in positioning techniques, and one could begin to zero in on accuracies sufficient to match variations in mean sea-level height (centimeters) and the very slow movements of tectonic plate motions and continental drift (centimeters per year). Using a combination of satellite techniques, observations on quasars and pulsars with a method called very long baseline interferometry, and extremely accurate clocks (1 part in 1016) that might be developed with superconducting cavities, one could aspire to positional accuracies of several centimeters relative to the reference ellipsoid. Whatever the mascons might turn out to be, however, they were an exciting and clearly significant discovery of the first extension of geodesy into the rest of the solar system. But while such detail may be of interest as answering questions that a decade before still puzzled researchers, their true significance lay in the fact that by the 1970s all known major problems of the high atmosphere and ionosphere had a satisfactory explanation based on sound observational data. From then on research in the upper atmosphere and ionosphere could be regarded as largely a mopping-up operation, the investigation of the finer details of what was going on. As for meteorology, the story was somewhat different. Sounding rockets provided the means for making measurements at all levels within the atmosphere, and satellites furnished worldwide imaging of cloud systems plus observations of atmospheric radiations and temperature profiles. These data amplified by orders of magnitude the amount of information available to the meteorologist, filling in enormous gaps that had existed over the oceans arid uninhabited land areas. But most of the impact of these data was on the forecasting of weather and climatic trends, where their contribution was of inestimable value. In a decade and a half of giant  strides in practical meteorology brought about in part by space methods, nothing of a revolutionary nature was contributed to the science of the lower atmosphere. In the mid-1970s atmospheric scientists still had to admit that there had been no breakthroughs attributable to space observations, although a wealth of new information was available and was under continuing intensive study. Most researchers were, however, optimistic that in the years ahead space data would share with ground-based, balloon, and aircraft measurements in leading ultimately to the breakthroughs in that understanding of the atmosphere needed to provide long-term forecasts of both weather and climate and to predict accurately the place and time of occurrence of severe storms. If there was no general breakthrough, there were several intriguing contributions from space research. For one thing, as with other areas of the earth sciences, the perspective afforded by satellite imaging was a great stimulus to research. The ability to see and assimilate with ease the distribution and kinds of clouds, the location and nature of weather disturbances, the distribution of vorticity, etc., gave the researcher a new handle on his subject. As one result, tropical meteorology, once regarded as a dead-end field, sprang to life; and scientists began to develop new insights into the relations between the tropics and mid-latitudes. Most of the sun's radiation lies in the visible wavelengths, which, along with some infrared and ultraviolet, control Earth's weather. This portion of the sun's spectrum is remarkably constant over time, although the question of just how constant remains open, and is one of the problems that space methods may help to solve. The short wavelengths, on the other hand, are extremely variable, their changes causing enormous variations within the high atmosphere. A natural question, then, was whether these upper atmospheric and ionospheric changes might not be related to meteorological changes. But, although sudden warnings of the stratosphere appeared to be associated with solar ultraviolet radiations, the general view was that this portion of the solar spectrum, containing less than one one-millionth of the energy carried in the visible wavelengths, could hardly have any significant effect. Yet, after more than a decade of space research, intriguing hints of relationships between upper atmospheric and meteorological activity began to appear.16 For example, particles-and-fields research had shown that the interplanetary medium around the sun was divided into sectors in some of which magnetic fields were directed away from the sun, while in others the magnetic fields were pointed generally toward the sun (fig. 46). The two kinds of sectors alternated with each other in going around the sun.17 Quite remarkably the boundaries between these sectors appeared to be associated with changes in atmospheric vorticity. Here was a phenomenon that could have a profound significance and the existence of which lent substance to the question of magnetospheric and upper atmospheric relationships to meteorology. As space scientists were getting a firm grip on the physics and chemistry of Earth's upper atmosphere, their attention was simultaneously be drawn toward the planets. What was known about planetary atmospheres had come from the efforts of a small, select group of scientists, mostly astronomers.18 Even more remote from the astronomers than Earth's upper  atmosphere had been from the geophysicists, the atmospheres of Mars, Venus, and the other planets taxed the investigators' ingenuity. Gross uncertainties often existed in their estimates of atmospheric properties. As with Earth's upper atmosphere, measurements from space probes promised to eliminate or reduce many of the uncertainties. From the point of view of comparative planetology, the relations between Venus, Earth, and Mars were ideal. Earth was clearly intermediate between the two others in many respects, and many scientists felt that a detailed study of all three should be of special benefit in understanding Earth. An example of the kind of interplay that was possible was furnished by the study of the role of halogens in the atmosphere of Venus. The investigations led to the suspicion that chlorine produced in Earth's stratosphere from the exhausts of Space Shuttle launches or from freon used at the ground in aerosol sprays might dangerously deplete the ozone layer, which was known to shield Earth's surface from lethal ultraviolet rays of the sun. In a similar manner, when Venus's atmosphere was found to exhibit a single circulation cell, global in extent,20 it was recognized that a careful study of this special example could yield important insights into the terrestrial atmosphere, where numerous circulation cells interact on a rapidly rotating globe. The clouds on Venus had long been a mystery, in which stratospheric aerosols now appeared to play a key role. The unraveling of the precise role of aerosols in the Venus atmosphere would certainly benefit studies of chemical contamination of Earth's atmosphere. At the other end of the scale, the role of dust storms in the thin Martian atmosphere could lend an important additional perspective to the role of dust in modifying Earth's climate. On a much grander scale, as Pioneer spacecraft passed by Jupiter in 1973 and 1974 it was learned that the famous red spot 21 was a huge hurricane large enough to engulf three Earths. What might be learned from the Jupiter hurricane about atmospheric dynamics that could be applied to the case of Earth remained to be seen. Thus, during the 1960s, while satisfactory answers were being obtained for all the known, major problems of Earth's high atmosphere, a good start was made on the investigation of the atmospheres and ionospheres of other planets. At the end of the 1960s the theorists could explain many features of sun-earth relations, the interplanetary medium, and the magnetosphere, but a large number of fundamental questions remained to be resolved. To the layman a schematic picture of the magnetosphere drawn at the end of the decade might look much like that of figure 35 (chapter 11), produced a half-dozen years earlier. But the expert would read into that diagram a new collection of rather subtle questions that still had to be answered before one could claim to have a thorough understanding of magnetospheric physics.26 The initial reaction to the discovery that Earth's magnetic field generated a huge bow shock in the rapidly moving solar wind was to  apply hydrodynamical theory. The general shape and position of the bow shock and the magnetopause could be understood from magnetohydrodynamical principles. Also, it appeared that one might explain the sudden commencement and initial phase of magnetic storms in a straightforward way. But the theory could not explain why the solar wind appeared to apply a surface drag to Earth's field, pulling some of the field lines out into the long geomagnetic tail that was a spectacular aspect of the magnetosphere. Instead one would expect the magnetospheric cavity to close off in a teardrop shape. To resolve some of these difficulties attention turned to the idea that the solar wind was a collisionless plasma, and the bow shock a collisionless phenomenon. Since under this assumption particle- to-particle collisions would be negligible, one had to seek the cause of the bow shock in cooperative field effects, such as interactions between electrostatic fields of the charged particles and magnetic field components perpendicular to the direction in which the gas velocity changed. As the 1970s opened, a great deal of study was going into collisionless shocks, particularly turbulent shocks, which observations showed Earth's bow shock to be. Other problems that required attention were the wide range of geomagnetic activity, the acceleration of particles within the magnetosphere, the production of the auroras, and the formation of the geomagnetic tail. In connection with these matters, the idea that parallel and opposite magnetic fields might merge and annihilate each other aroused stormy debate. One could point to cases in which such a process might be important. For example, if the field in the solar wind had a southward component when it struck Earth's magnetic field at the nose of the magnetosphere, where the terrestrial field would be northward, merging and annihilation might take place. Or merging could occur when field lines in the interplanetary medium happened to be essentially parallel to field lines in the magnetospheric tail. With such problems the magnetospheric physicists had an agenda that would keep them amply occupied during the 1970s. Moreover, early in that decade they got their first look at another planetary magnetosphere-that of Jupiter.27 As the fascinating complexity of Earth's magnetosphere and its important role in sun-earth relationships had unfolded, physicists had immediately thought of the possibility of other planetary magnetospheres. It was known from observation of Jovian radiations that Jupiter had a very strong magnetic field.28 As a consequence no one doubted that the first spacecraft to reach the giant of the solar system would encounter a well defined magnetosphere. The final topic of this section concerns the planetary bodies themselves. While investigation of Earth's atmosphere, ionosphere, and magnetosphere-and related solar studies-were naturally the first areas of research in the space science program, they had only limited appeal to the layman. As exciting as these challenges were to the researchers, the average person could hardly relate to himself the magnetohydrodynamic concepts, terrestrial ring currents, or complex photochemical reactions in the ionosphere. But the investigation of the moon and planets was different. Here  in pictures one could see landscapes and clouds-often strange, to be sure, but landscapes and clouds nevertheless. One could envision spacecraft orbiting a planet or landing on its surface and Could identify personally with astronauts stepping onto the bleak and desolate moon. As a consequence NASA had little difficulty in capturing and holding a widespread interest in this aspect of the space science program. The exploration of the moon and planets began with the Soviet Luna flights in 1959. From that time on, every year at least one mission to the moon or a planet was attempted by the United States or the Soviet Union. The American assault on the moon began with Pioneers, followed by Rangers, then the soft-landing Surveyors. 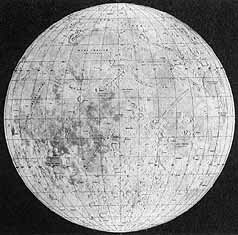 In the summer of 1966 the first of five Lunar Orbiters began the task of mapping almost the entire surface of the moon. Even an Explorer was injected into lunar orbit to study the space environment around the moon. The climax was reached when the Apollo missions began manned exploration of the moon with the orbital flight of Apollo 8 in December 1968 and the first manned landing in July 1969. While Apollo was in progress the Soviet Union conducted a series of sophisticated unmanned lunar missions that included circumlunar flights of Zond spacecraft, which were successfully recovered with pictures they had taken of the moon. More advanced Luna spacecraft soft-landed on the moon, carrying roving vehicles to investigate the lunar surface in situ and radio the information to Soviet stations on Earth, and in some cases to send samples of lunar soil to Earth for investigation in the laboratory. The success of the Soviet unmanned rovers and sampling missions sparked an intense debate between the scientists and NASA, many of the scientists feeling that the unmanned approach to the study of the moon was the wiser, and by far the more economical. Criticism was blunted, however, by the tremendous success of Apollo. The astronauts brought back hundreds of kilograms of lunar rocks and soil from six different locations, the analysis and study of which quickly engaged the attention of hundreds of scientists throughout the United States and around the world. In addition to collecting lunar samples, the astronauts also set up nuclear-powered geophysical laboratories instrumented with seismometers, magnetometers, plasma and pressure gauges, instruments to measure the flow of heat from the moon's interior, and laser corner reflectors for geodetic measurements from Earth. The geophysical stations operated for many years after the astronauts had left, radioing back volumes of information on the moon's environment and its seismicity. Twice satellites were left behind in lunar orbit for lunar geodesy and to make extended chemical analyses of the lunar surface material from observations of the short-wavelength radiations of the moon. In November 1973, Mariner 10 left on a journey that would take it first by Venus and then on to Mercury, where the spacecraft arrived in March 1974 taking pictures and making a variety of other measurements. Having completed its first Mercury mission, Mariner 10 was redirected by briefly firing its rockets so that the spacecraft would visit Mercury again in September of 1974. By visiting Mercury several times, Mariner 10 provided the scientists with the equivalent of several planetary missions for little more than the price of one.38 Also, with the visit to Mercury, scientists at long last had close looks at all of the inner planets of the solar system, including the two satellites of Mars. The result of all these space probe missions was the accumulation of volumes of data on the moon and near planets, illuminated with thousands of highly detailed pictures. The photo resolutions exceeded by orders  of magnitude what had been possible through telescopes. 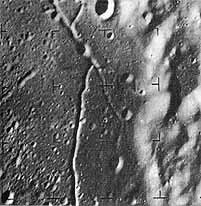 When Rangers crashed into the moon the closeup pictures sent back just before the impact were a thousandfold more detailed than the best telescopic pictures previously available (fig. 47). After landing on the surface with its television cameras, Surveyor afforded another thousandfold increase in resolution, revealing the granular structure of the lunar soil and a considerable amount of information on the texture of lunar rocks (fig. 48). 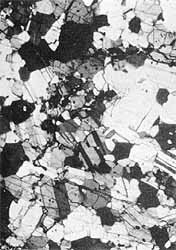 In the laboratory Apollo samples put the moon's surface under the microscope, as it were (fig. 49). As for the planets no detail at all had been available before on the surface characteristics of distant Mercury or clouded Venus. Some Mariner 10 pictures afforded better resolution for Mercury than Earthbased telescopes had previously given for the moon (figs. 50-51). 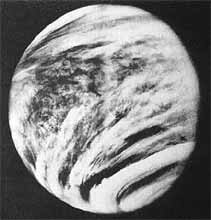 Ultraviolet photos of Venus from passing spacecraft showed a great deal of structure in the atmospheric circulation that was hitherto unobservable (fig. 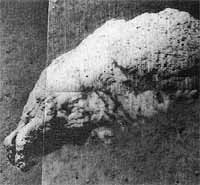 52), while radar measurements from Earth penetrated the clouds to reveal a rough, cratered topography.39 For Mars, the indistinct markings observable from Earth were replaced with sufficient detail to show craters, volcanoes, rifts, flow channels, apparently alluvial deposits, sand dunes, and structure in the ice caps (figs. 53, 54-55, 56, 57, 58, 59, 60). Added to such pictures, data on planetary radiations in the infrared and ultraviolet; surface temperatures; atmospheric temperatures, pressures, and composition (when there was an atmosphere); and charge densities in the ionosphere (when there was an ionosphere)-this wealth of information completely revitalized the field of planetary studies, which had long been quiescent for lack of new data. By the early 1970s comparative planetology was well under way, although one must hasten to add that the task ahead of understanding the origin and evolution of the planets was one of decades, not merely months or years. Nevertheless, progress was rapid. Much was learned about the mineralogy and petrology of the moon, and by extrapolation probably about the other terrestrial planets. Radioactive dating of lunar specimens led to the conclusion that the moon is probably some 4.6 billion years old, an age consistent with the ages of meteorites and the presumed age of Earth. The moon was found to be highly differentiated; that is, the lunar materials, through total or partial melting, had separated into different collections of minerals and rock types. The maria were mainly basalt, similar to but significantly different from the rocks of the ocean basins on Earth. In contrast the lunar highlands were rich in anorthosite, a rock consisting mainly of the feldspar calcium aluminum silicate. Both maria and highlands were much cratered-as could already be seen from Earth-and one could now see that the crater sizes extended down to the very small, showing that the moon had been bombarded by very small particles as well as by very large objects. The entire surface was covered with fine fragments and soil, broken rocks and rubble-crustal material chopped up by the cratering  process. A considerable amount of glass was found, some of it in coatings splashed onto other rocks, much of it in the form of tiny glass beads of a variety of colors dispersed through the soil. Figure 47. Ranger photos of the moon. 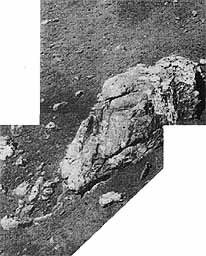 The closeup picture, above, of the crater Alphonsus floor taken by Ranger 9 in 1965, shows detail not available in telescopic pictures taken from Earth. Ranger VIII and IX, JPL Tech. Rpt. 32-800, pt. 2 (15 March 1966), p. 353, fig.7. Figure 48. Surveyor photos of the moon, top right and right. Sitting on the moon's surface, Surveyor 1, in 1966 provided a millionfold increase in resolution over that of Earth-based pictures. Surveyor Program Results, NASA SP-184 (1969), p.259, fig.7-42. Figure 49. Thin section of Apollo 16 lunar sample 67075. Samples of lunar material brought to Earth made it possible to examine minerals of the moon under a microscope. The area of the section photographed is 2.3 mm long. Figures 50-51. 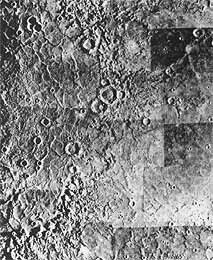 Photomosaics of Mercury. Fig.50, left: Eithteen pictures, taken at 42-second intervals, were enhanced by computer at the Jet Propulsion Laboratory and combined into this mosaic. 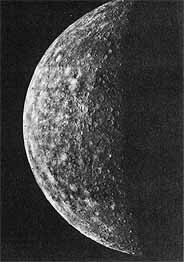 The pictures were taken from Mariner 10 during 13 minutes when the spacecraft was 200 000 kiloeters and 6 hours away from Mercury on its approach to the planet, 29 March 1974. About two-thirds of the portion of Mercury seen in this mosaic is in the southern hemisphere. Largest of the craters are about 200 kilometers in diameter. Illumination is from the left. 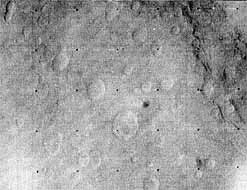 Fig.51, right: The semicircle of cratered mountains in the left half of the mosaic forms the boundary for the largest basin on Mercury seen by Mariner 10. The basin is near a subsolar point when the planet is at perihelion, leading investigators to suggest the name Caloris for it. The ring of mountains is 1300 kilometers in diameter and up to 2 kilometers high. The basin floor consists of severely fractured and ridged plains. Figure 52. Cloud structure on Venus. The structure reveals the pattern of atmospheric circulation on the planet. The picture was taken in ultraviolet light by Mariner 10 cameras 6 February 1974. Figure 53. Craters on Mars. The slightly darker region to the right is Hellespontus; the lighter region to the left, Hellas. Apparently an escarpment forms the boundary between the two regions. 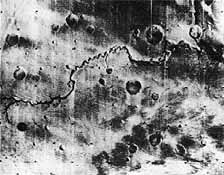 The area of the photo, taken by Mariner 7 in 1969, is 720 by 960 kilometers. Figures 54-55. Volcano on Mars. Olympus Mons was photographed 7 January 1972 by Mariner 9. The top photo shows an area 435 by 655 kilometers. The lower, high-resolution photo, corresponding to the inscribed rectangle at the top, shows details of lava flow down the mountain side. Figure 56. Rifting on Mars. The superimposed outline of the United States emphasizes how the great canyon on Mars dwarfs the Grand Canyon on Earth. 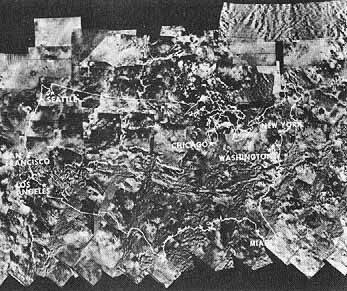 The photomosaic was made from Mariner 9 pictures obtained in several weeks of photographic mapping of the planet. The area covered reaches from -30° to +30° latitude and from 18° to 140° longitude. Figure 57. Flow channel on Mars. This valley, some 400 kilometers long, resembles a giant version of an arroyo on Earth. Figure 58. Evidence of water flow on Mars, at right. Braided channels at -6° latitude, associated with Vallis Mangala in the Amazonis region of Mars near longitude 150°. Such features are common to sediments deposited during meandering stream flow. Each of the two frames in this composite covers about 30 by 40 kilometers. Figure 59. Sand dunes on Mars, above. 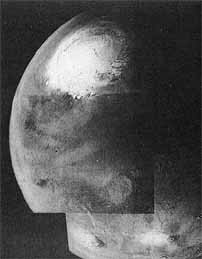 The presence of sand and dust on Mars was dramatically emphasized by the great dust cloud that envelopped the planet as Mariner 9 approached. After the cloud of dust had settled, deposits of sand were observed to shift about from photos of the same region taken at different times. Figure 60. Ice Cap on Mars, below [Above]. The photo shows the northern hemisphere of Mars from the polar cap to a few degrees south of the equator. At the stage shown, the ice cap is shrinking during late Martian spring. Figure 61. The moon. The great maria, like Mare Imbrium in the upper hemisphere, were probably gouged out by huge meteorites, and subsequently filled by extensive flows of dark basaltic lava. Figure 62. Structure of the moon. As on Earth, seismic data reveal a great deal about internal structure. Y. Nakamura, G. Latham, et al., in Proceedings of the Seventh Lunar Science Conference, ed. R. B. Merrill (New York: Pergamon Press, 1976), pp. 3113-21; reproduced by permission of Gary V. Latham. Figure 63. Crustal evolution in silicate planets. Evidence suggests that earthlike planets all follow similar courses of evolution. 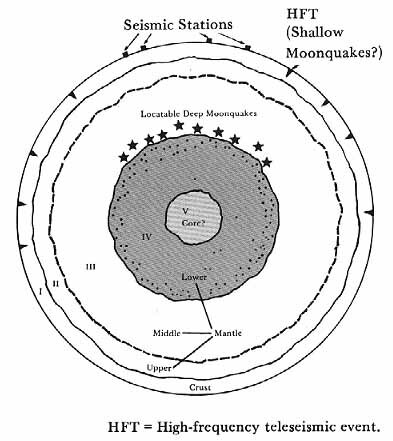 Paul D. Lowman, Jr., in Journal of Geology 84 (Jan. 1976): 2, fig.1; reproduced courtesy of Dr. Lowman. .....taken by Earth, but was well behind, only now approaching the tectonic plate stage. The moon and Mercury had long since run the course of their evolution, which terminated well before a tectonic plate stage. This picture, although consistent with much of the data, could hardly be regarded as more than tentative. It would have to pass the test of further observations and measurement, and stiff debate. But one satisfying feature was the emphasis the theory gave to the kinship of the planets with each other. As theorists had pointed out, if the planets did form from the material of a solar nebula left over after the creation of the sun, then their individual characteristics should depend to a considerable extent on their distances from the sun (fig. 64). Near the sun, where the nebular material would be heated to rather high temperatures by the sun's radiations, one could expect to find planets composed primarily 9f materials that condense at high temperatures, the silicates and other rock-forming minerals. Moreover, the densities of the planets could be estimated according to distance from the sun by considering what compounds were likely to form at the temperature to be expected at Mercury's distance, which at the distance of Venus, which in the vicinity of Earth, etc. From what was known of the inner planets, they did indeed fit such a picture. As for the outer planets, one would expect them to consist of large quantities of the lighter substances-hydrogen, helium, ammonia, methane-which could condense out of the solar cloud only at the low temperatures that would exist so far from the sun. Qualitatively, the outer planets also fitted this picture, but quantitatively there were discrepancies. To develop the true state of affairs in proper perspective, an intensive investigation  of the outer planets was called for, and was on the agenda for the 1970s and 1980s. The investigation got off to an exciting start with the visit of Pioneer 10 to Jupiter in 1973. It was clear that an exciting period in planetary exploration lay ahead as scientists began to amass data on the atmospheres, ionospheres, and magnetospheres of these strange worlds. While these planets themselves would be quite different from the terrestrial planets, their satellites could be expected to resemble the latter in many ways. Moreover, as many persons pointed out, the satellite systems of Jupiter and Saturn might turn out to be very much like miniature solar systems, particularly the satellites that formed along with the parent planet rather than being captured later. Supporting this view was the early discovery from the Pioneer observations that the four regular satellites of Jupiter decreased in density with increasing distance from the planet, as though they had formed from a cloud of gas and dust that was hotter near the planet than it was farther away.45 The opportunities for important research seemed endless. Figure 64. Origin of solar system planets. The higher temperature materials, like silicates, condense nearer the sun; the more volatile substances, farther away. ....with Earth life. Most scientists considered the chance of finding life elsewhere in the solar system to be minute, but it was universally agreed that the discovery of such life would be a tremendously important event. Thus, while recognizing the unlikelihood of finding extraterrestrial life, many considered that the potential implications offset the small chance of finding any, and accordingly devoted considerable time to studying in the laboratory the chemical and biological processes that seemed most likely to have been part of the formation of life. They sought out Earth forms that could live under extremely harsh conditions-like arid deserts, the brines of the Great Salt Lake, or the bitter cold Antarctic-and paid special attention to them. And they devised experiments to probe the Martian soil for the kinds of life forms deemed most likely to be there. Nor was any life found on Mars, even though the two Viking spacecraft with their samplers and automated laboratories were set down in 1976 in areas where once there might have been quite a bit of water.47 Still, the subject could hardly be called closed. If life had been found, that would have settled the question. But that life was not found in two tiny spots on Mars did not prove that there was no life on the planet. So, although the first attempts were disappointing, it could be assumed that future missions to Mars would pursue the question further. Nor would it be likely that exobiological research would be confined to the Red Planet. At the very least, one would expect that, as scientists studied the chemical evolution of the planets and their satellites, they would keep the question of the formation and evolution of life in mind. While the foregoing has touched upon but a few of the results accruing from the exploration of the solar system, still the reader should be able to derive some insight into the impact that space science was having upon the earth and planetary sciences. For one thing the study of the solar system was revitalized after a long period of relative inactivity. Second, lunar and planetary science became an important aspect of geoscience, attracting large numbers of researchers. Third, the new perspective afforded by space observations gave an immeasurable boost to comparative planetology, a field that made great strides during its first 15 years. Nevertheless, no one doubted that in the mid-1970s comparative planetology still looked forward to its most productive years. All of which leads to the usual question. If space science was having such a profound impact on Earth and planetary sciences, was space  science producing a scientific revolution in the field? In the broad sense, no. But, viewed strictly from within the discipline there were indeed numerous revolutionary changes. Much new information was accumulated, permitting the theorist to deal in a realistic way with topics about which one could only speculate before. Many had to relinquish pet ideas about the nature of the lunar surface or the markings on Mars. Proponents of a cold moon were faced with incontrovertible evidence of extensive lunar melting. No pristine lunar surface was to be found; instead a substantial evolution had marked the moon's first one and a half billion years. Far from being an inert planet, Mars turned out to be highly active. Of course, in different aspects of the subject many investigators had been on the right track. 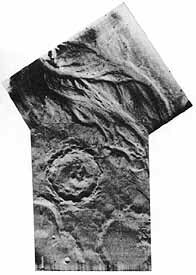 Noted astronomers R. B. Baldwin and E. J. Opik had correctly anticipated that many of the features of Mars were due to craters.48 Gerard Kuiper had been sure that volcanism was important on the moon, as he explained many times to the author. Thomas Gold had been certain that the lunar surface would contain a great deal of fine dust. Yet, no one had succeeded in putting the separate pieces together in satisfactory fashion. Thus, the most revolutionary aspect of space science contributions to the earth and planetary sciences was probably in helping to develop an integrated picture of the moon and near planets. This was an enormous expansion of horizons, an expansion that could be expected to continue with each new planetary mission.